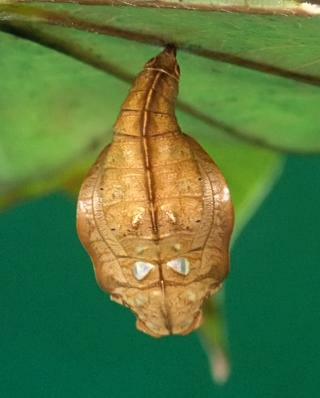 This Caterpillar hatches from an egg that is pale yellow or green, and knobbly. The egg is laid singly on the tip of a leaf of a food plant. 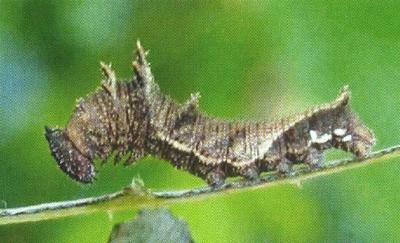 The caterpillar is coloured with patches of green and brown. It has five pairs of branched spines, one pair on each of the mesothorax and metathorax, and a smaller pair on each of the abdominal segements two and eight, and another pair on its head. 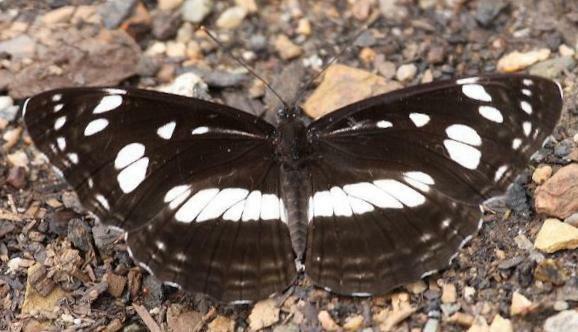 There are often some white spots on the last abdominal segments. When disturbed, the caterpillar everts a white organ under the head which sometimes makes a pungent smell. Hackberry ( Celtis paniculata, ULMACEAE ). 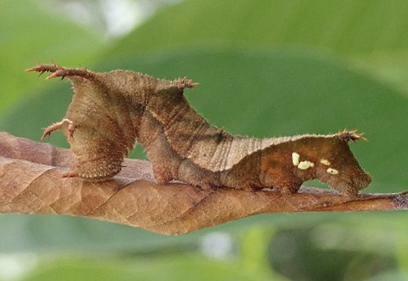 The caterpillar hides underneath a curtain of bits of leaf that it cuts and hangs on the leaf where it rests. It grows to a length of about 3 cms. 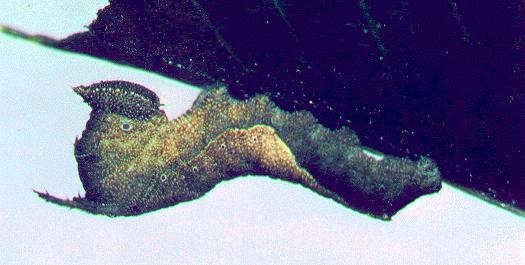 The pupa is patchy brown, with a pair of white spots on the metathorax. 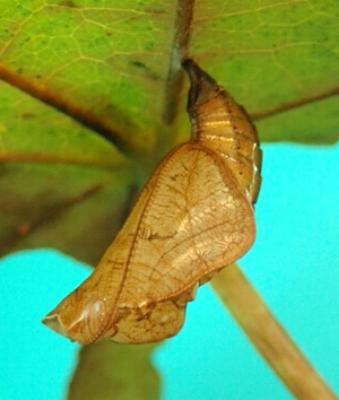 The pupa hangs from a black cremaster attached under a leaf of the food plant. It has a length of about 2 cms. The adults are dark brown on top, with a number of white patches tinged with pale green. Underneath the base colour is a pale brown, but with the same pattern of white patches. 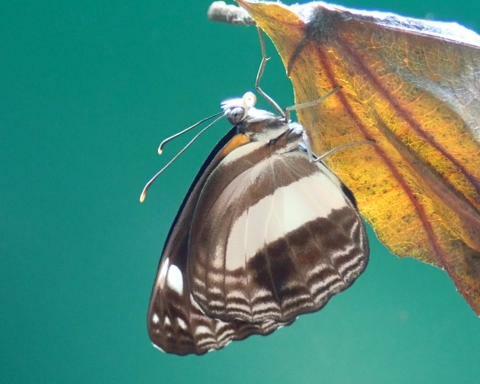 The butterflies have a wing span up to 6 cms. 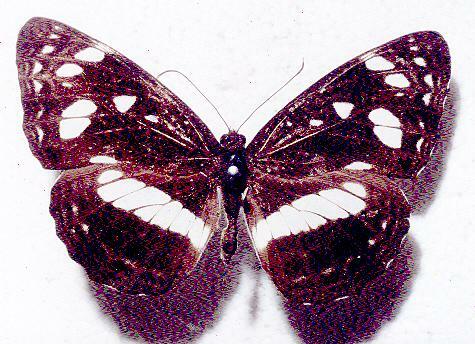 Butterflies of Australia, CSIRO Publishing, Melbourne 2000, vol. 2, pp. 558-559. Earthling Enterprises, Brisbane, 2005, p. 47. Newsletter Issue 32 (March 2004), p. 6. Part 26, Volume 8 (1858), p. 8, No. 16. and also Plate 50, fig. 1.